Poll: Should Pluto be Re-Instated as a Planet? 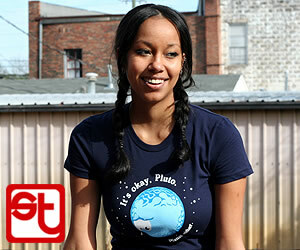 Snorg Tees advertisement: "Its okay Pluto, I&apos;m not a planet either"
This Pluto debate has taken the world by storm. Generally, people are upset about Pluto being down-graded to a “dwarf planet,” and then the IAU issue an announcement that Pluto can actually have its own class of minor celestial bodies; calling this type of Kuiper Belt object a “Plutoid.” Great, at last, Pluto can be respected by calling a whole number of other small rocky bodies; Plutoids. Suppose you were outside and saw this: (insert picture of a green leafy plant that is about 5 feet tall). What would you call it? Some might call it a tree, others might call it a bush. Does the name change what it is? What if scientist came up a classification for determining if something was a bush or a tree. According to wikipedia, there is not complete agreement on the definition of a tree. This is ok, because the name of something isn’t really that important. * The most massive object in its neighborhood of the solar system (this is where Pluto fails). Pluto fails the last criteria because it is in the area of Neptune (sometimes it is even closer to the Sun than Neptune). Thus, alas, Pluto is not classified as a planet. It shall be called a dwarf planet. Pluto IS a planet because unlike most objects in the Kuiper Belt, it has attained hydrostatic equilibrium, meaning it has enough self-gravity to have pulled itself into a round shape. When an object is large enough for this to happen, it becomes differentiated with core, mantle, and crust, just like Earth and the larger planets, and develops the same geological processes as the larger planets, processes that inert asteroids and most KBOs do not have. Not distinguishing between shapeless asteroids and objects whose composition clearly makes them planets is a disservice and is sloppy science. As of now, there are three other KBOs that meet this criterion and therefore should be classified as planets—Haumea, Makemake, and Eris. Only one KBO has been found to be larger than Pluto, and that is Eris. The IAU definition makes no linguistic sense, as it states that dwarf planets are not planets at all. That’s like saying a grizzly bear is not a bear. Second, it defines objects solely by where they are while ignoring what they are. If Earth were placed in Pluto’s orbit, by the IAU definition, it would not be a planet. That is because the further away an object is from its parent star, the more difficulty it will have in clearing its orbit. Significantly, this definition was adopted by only four percent of the IAU, most of whom are not planetary scientists. No absentee voting was allowed. It was done so in a highly controversial process that violated the IAU’s own bylaws, and it was immediately opposed by a petition of 300 professional astronomers saying they will not use the new definition, which they described accurately as “sloppy.” Also significant is the fact that many planetary scientists are not IAU members and therefore had no say in this matter at all. Many believe we should keep the term planet broad to encompass any non-self-luminous spheroidal object orbiting a star. We can distinguish different types of planets with subcategories such as terrestrial planets, gas giants, ice giants, dwarf planets, super Earths, hot Jupiters, etc. We should be broadening, not narrowing our concept of planet as more objects are being discovered in this and other solar systems. In a 2000 paper, Dr. Alan Stern and Dr. Hal Levison distinguish two types of planets—the gravitationally dominant ones and the smaller ones that are not gravitationally dominant. However, they never say that objects in the latter category are not planets. Where I can to find lbogs on this topic? Previous Previous post: What is the Higgs Boson?